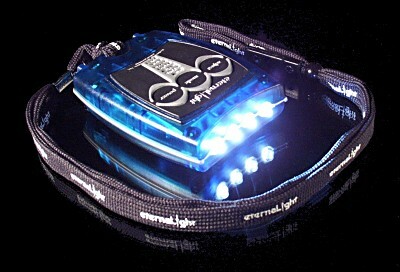 eternaLight(tm) Model 4X - "EliteXRay"
This is our most refined flashlight yet! The EliteXRay is crafted in a nearly indestructible translucent blue super-strength polycarbonate case, with a black and silver color scheme. Featuring our exclusive NightBeacon(tm) function for night visibility. 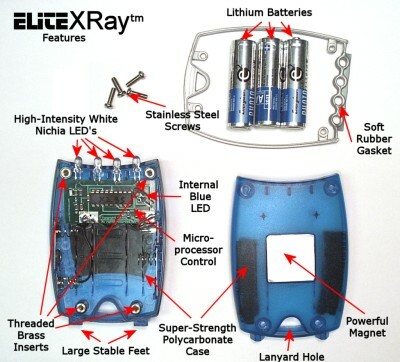 The EliteXray is also equipped with lithium batteries for water buoyancy, maximum extreme temperature performance and shelf life. It also features our exclusive inverted membrane for maximum tactile feedback and all the standard eternaLight smart series features. Besides being the most advanced, the EliteXRay(tm) is the most compact, powerful, durable, dependable, versatile and unique flashlight ever made! Web price only $69.99 each!